Should consumers pay extra to go off the grid? 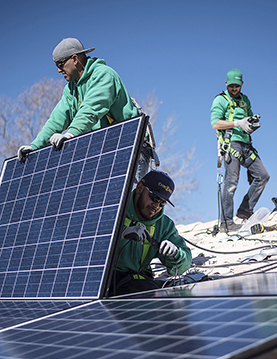 The cost of installing a residential or commercial solar energy system has declined rapidly in recent years, aided by federal tax breaks backed by the Obama administration. Solar users say the technology saves them money by allowing them to generate their own electrical power and helps protect the environment by reducing demand on conventional coal- and natural gas-burning power plants. Solar remains a tiny fraction of overall power generation in the United States, but it is growing rapidly. As solar expands, electric utilities all over the country are struggling to integrate it into the existing power system. They argue that the rapid growth in solar threatens the financial stability of the power grid and that solar users should pay to help maintain the vast system of poles, wires and transformers — even if their conventional power needs decline. Meanwhile, the auto industry is looking to solar as an alternative power source, a trend that could add additional pressure to the struggling oil industry.